Domestic abuse victims in Buckinghamshire are to be offered GPS tracking devices. Thames Valley Police said it hopes to dramatically speed up officer response times if the wearer becomes a victim of violent crime again. 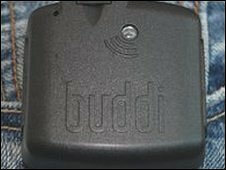 Thames Valley Police and Buckinghamshire County Council are providing the special "buddi" devices. They send a signal to a satellite, revealing a person's position to police within 10 metres. The alarms will be made available to victims of domestic abuse and also people described as vulnerable to honour-based violence. The move has been welcomed by Buckinghamshire County Council's domestic abuse co-ordinator, Sue Moss who said it would "reduce the risk posed to victims and (help) them feel safer in their day-to-day lives." The police and council are trialling five GPS systems in Buckinghamshire at a cost of £3,000 for six months. Each retails at £299 and can report the speed that the wearer is travelling at and whether they have fallen.